Although I did a lot of bunny paintings over the years, for some reason, I entered, unplanned, a bunny phase! If it’s not birds that keeps on popping on my canvasses, it’s girl paintings full of symbolism, or feathers, clocks or cats, eyes, even pencils, o yes, and fishes! It’s just crazy how themes run away with me for a while, and then, as unexpectedly as it started, it stops! Not necessarily forever, it might return, dressed in another jacket maybe, or just revisit me for a while. Grab your lettuce and go on a journey through my bunny paintings. This little shy Bunny is painted on the cover of an old book. As I like the idea or recycling, I like to use objects like books, to paint on. 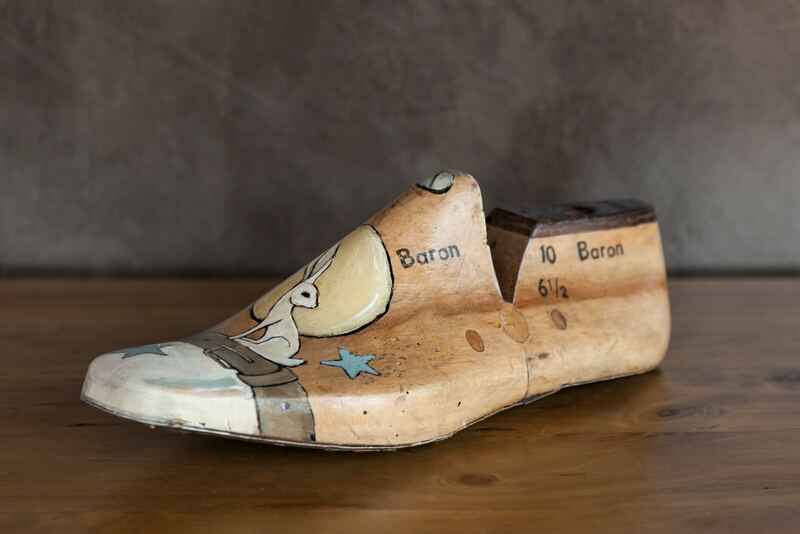 Also, it adds a unique touch to the painting, the book has a little hook at the back, so you can hang it as a painting, or just display it on a coffee table together with a few interesting objects. It is not often that men appear in my art, and here is a man with a rabbit! Nature lover. 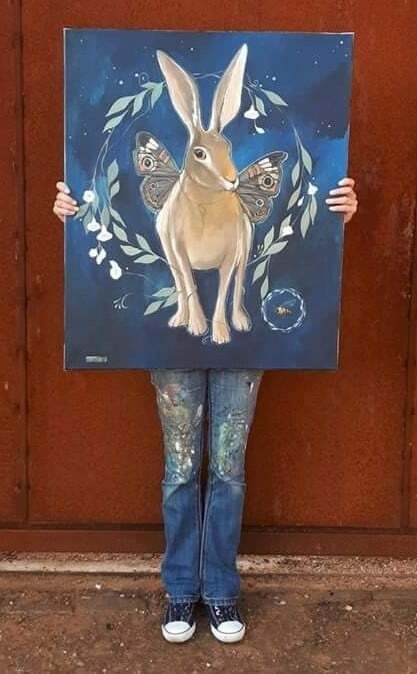 Sometimes it’s not bunnies but only the ears that appear in a painting! I am working on a product range and had a few hick-ups and stuff holding me back, but it will be up and running by March next year. I will keep you posted on that. Here is a sneak peek of what you can expect. You can email me at kotzeart@gmail.com if you have any questions and please remember to fill in the subscription form at the beginning of this blog post to receive my newsletter with updates about exhibitions and special promotions. 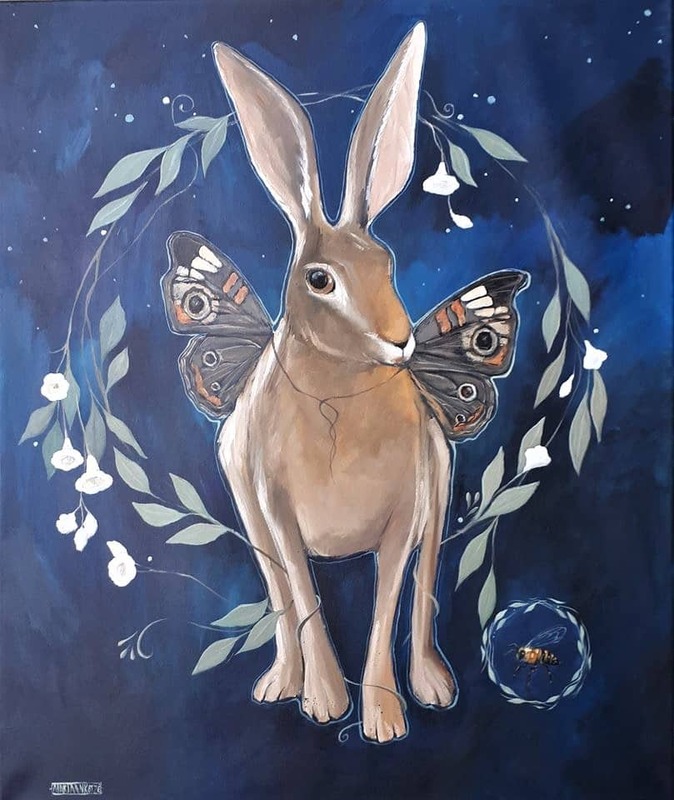 Posted in Blog and tagged paintings, Mariaan Kotze, Acrylic Painting, artist, Butterfly, South African artist, art for sale, whimsical art, symbolic art, Bunnies, rabbits, explore, travel, butterfly wings.